Has your property housed a previous drug operation? Whether it was a methamphetamine lab or any other type of drug house – KRI specializes in testing and decontaminating properties located in Texas, Arkansas, Oklahoma and Louisiana. The dangers that remain after meth labs and their cooks are out of work don’t disappear in time. Many states make it mandatory for real estate agents and home owners to disclose if a property has been contaminated but fewer require rental properties to disclose that information and sadly many have to leave their home and all of their possessions due to the toxins left from methamphetamine manufacturing. Regardless of specific state regulations, any property or location that was previously used to cook meth or other drugs can have devastating effects on the health of the people and animals residing, unless the area has been professionally decontaminated by a certified meth lab cleanup contractor. There may be noticeable odors, stains, burns and even residue left over at the location but not all properties previously exposed will have visible signs but all properties must be professionally remediated to ensure they will once again to be safe. The level of property contamination needs to be tested, prior to any cleanup methods. We start our drug house cleanup services by collecting test samples, once the level of contamination is confirmed we’ll develop a decontamination plan and follow it exactly. Once our decontamination process has been completed we will conclude our services with one last sample to guarantee safety for you, your family and anyone else residing in the location. 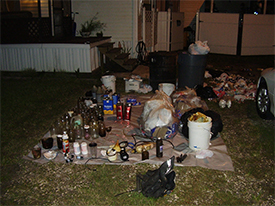 Meth lab remediation isn’t just a process of decontamination the location where meth was cooked. The entire meth house or property has been filled with toxins, from the carpet to the furniture, drywall, HVAC system – the entire property is essentially turned into a hazardous waste site. The toxic chemicals that are emitted when cooking meth can be absorbed through ingestion, skin absorption and can even be breathed in. The dangers of meth labs or drug manufacturing aren’t only confined to the walls of the property. Many times waste is dumped outside the location, chemicals are burned in order to quickly dispose of evidence, dumped down the drain and in locations that have well or septic systems the filtration systems can be completely contaminated, as well as the soil. Which is why professional methamphetamine decontamination, and laboratory analysis, is crucial for the safety of everyone in, and around, any environment once used to manufacture illegal drugs. For Methamphetamine and Drug Cooking Cleanup Services, which are many times paid for by insurance, in Texas, Arkansas, Oklahoma or Louisiana contact KRI for a confidential consultation at 1-888-382-2930, email at [email protected] or fill out our service inquiry form on our contact page. To provide the utmost care and sensitivity when helping you when you need it the most. Our trained and experienced technicians will help restore a safe environment for your home, residents, employees, or patrons.